I am really into Coffee-Tea mixes these days. I have always liked the taste of beverage combinations. Long ago, during one of my temporary jobs before I graduated, I had a mix of Coffee, Tea, Milo and Horlicks every single day in the office. After all, the office pantry had all of these! 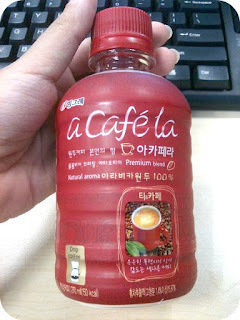 Anyway I recently discovered this Korean coffee series. They have different coffee flavours and this particular one is a Coffee-Tea mix that I don't mind. It is a tad too sweet but that's fine for a morning rush. I grab them at Shell stations when I go tank up on petrol. The empty bottles, stripped of the labels and filled with rice, make excellent shakers for Bubbles to play with! See. Your creative streak is showing through strongly. Bubbles is going to have such fun toys! "Regular toys? Naaah. I've toys made my Mommy!" It can be a fun activity for her to fill it too! Bubbles should like the sound produced from the bottle! Only these ole bottle shaker tricks! Haven't got round to sewing anything from that cute book. OOh, cool! I should try that. Now she seems to like sounds though but I can still do floaty objects in addition to noisy ones. She does! Very much :) She understands the word "Shake" or "Yao" (Mandarin), and will vigorously shake the object she's holding when asked to do so. wow, you mean you made a spoon of coffee+tea+milo+horlicks! wonder how that tastes! Yes a spoonful of each into a mug of hot water! Erm, it tastes very 'beveragey'! haha. I think the flavours blend quite well although I do recall tweaking quantities of each to something I finally preferred. good to have home-made toys!